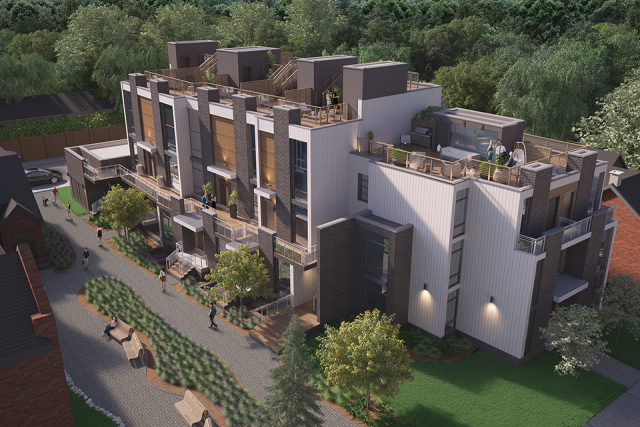 Offering 12 exclusive luxury modern townhomes in the heart of Leslieville with a mixture of full, upper and lower luxury townhome units many of which feature their own private rooftop terraces. Featuring exceptionally modern architecture, with an articulated interplay of shapes, creating an organic aesthetic that is warm, visually exciting and undeniably sophisticated. The townhomes offer a perfect marriage of architecture and interior design creating one-of-a-kind residences that offer panoramic and unobstructured views, sleek gourmet kitchens, large private ourdoor space for each unit, and superior finishes throughout.